The yacht was built by Feadship, in Holland, in 2008, which Chris Callahan at Moran Yachts notes is at the top of the field. 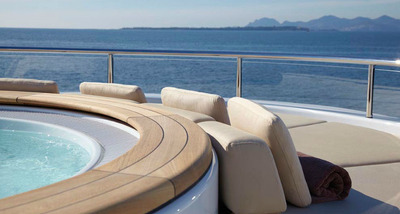 Judging by the quality of the craftsmanship on board, we think he’s right. 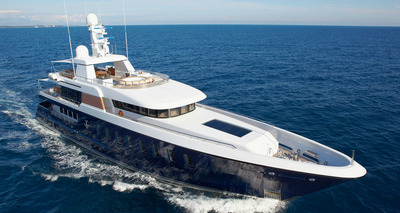 At port in Miami, the Madsummer is listed for sale by Moran Yachts, for €24.95 million ($32.8 million). 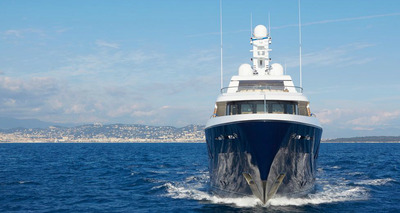 It's powered by two engines that each produce 1,056 horsepower. 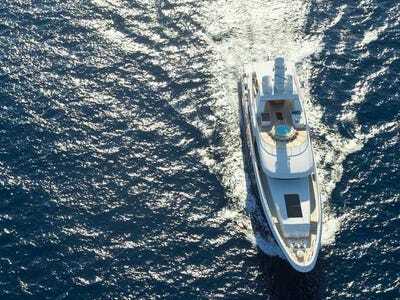 That's not a whole lot of power: The yacht's max speed is 15 knots (17.3 mph). 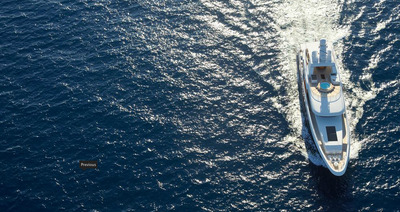 The tanks hold enough fuel to go more than 5,000 miles, at a modest speed of 10 knots (11.5 mph). 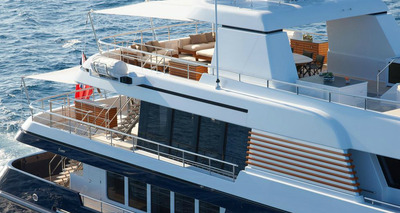 There are six staterooms, and three decks for hanging out outside. 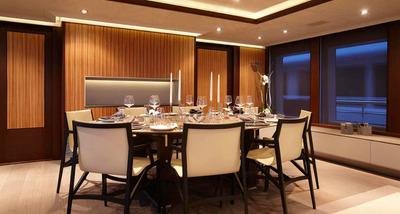 The main salon is simply but elegantly decorated. 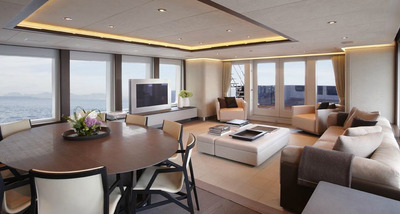 The same goes for the sky lounge. 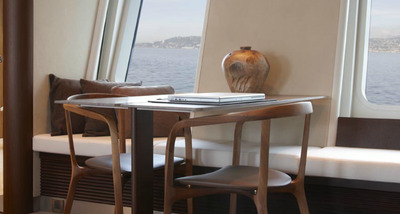 This little table looks like a nice place to get some work done, or play a board game. 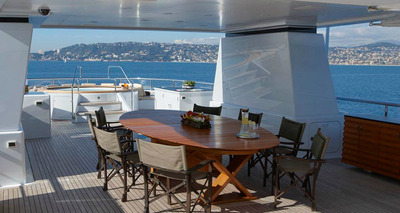 The yacht's main dining table is located on the main deck. It doesn't look like there's room for 12 people at the table. 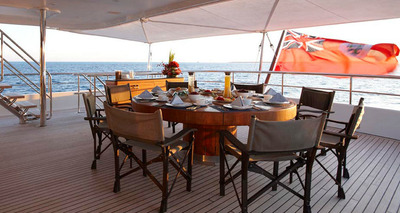 For less formal meals, head up to the sun deck. 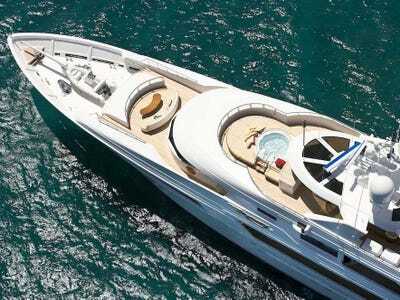 Guests can enjoy the view from the yacht's prow, while relaxing in the Jacuzzi. 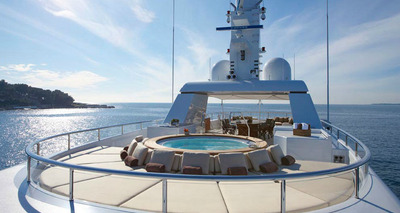 The hot tub is surrounded by sunbeds for those who want to work on their tans. 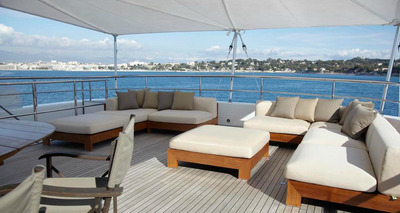 If the sun gets too strong, there are lounge chairs under a retractable awning, at the rear of the yacht. 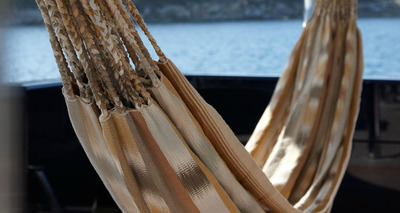 Even with all the sunbeds around, this hammock looks like a great place to take a nap. 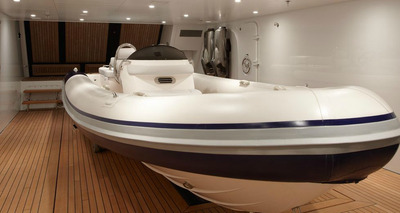 The 'Madsummer' comes equipped with a lot of toys, including this motor boat. 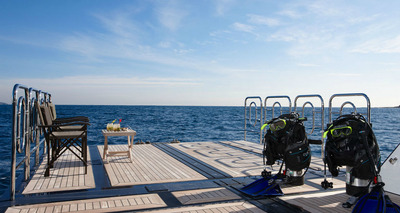 There's also SCUBA equipment, an inflatable trampoline, an inflatable water slide, paddle boards, and wake boards. 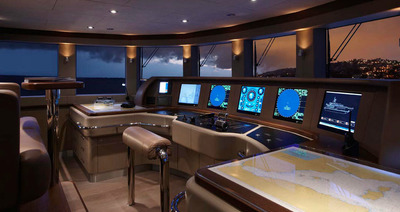 There are a few seats in the wheelhouse, but whoever's at the controls is stuck with something less comfortable. 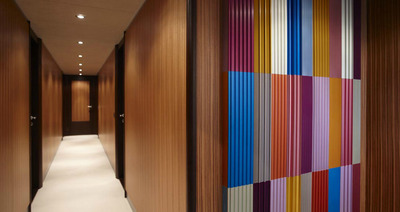 The hallway features a nice splash of colour. 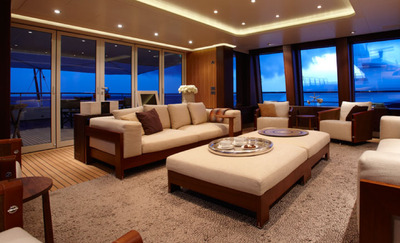 The master suite is located forward, on the main deck. 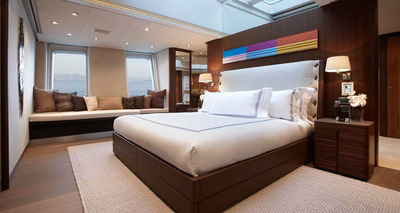 The hallway's colourful touch is echoed above the headboard of the king size bed. 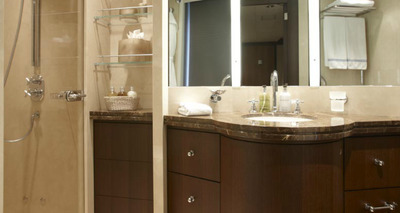 The master bath includes a large tub, and some lovely plant life. 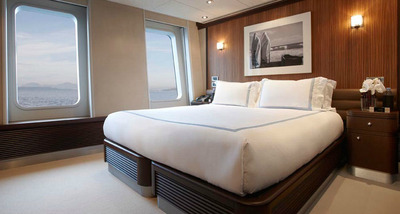 There are four double guest staterooms on board. Each has a queen bed or twin singles. 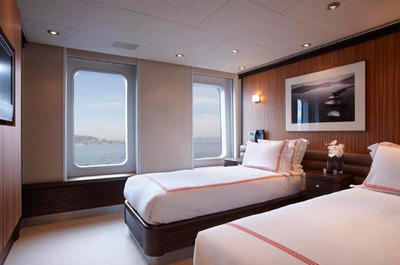 No portholes here: This stateroom, with twin single beds, has two large windows. 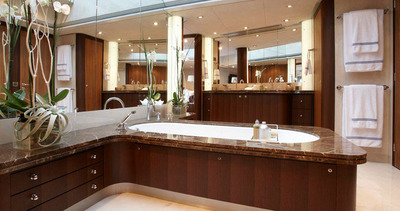 The guest bath is not a luxurious as the one in the master suite, but it's still pretty nice. 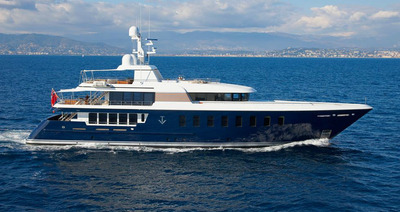 Currently at port in Miami, the 'Madsummer' is for sale by Moran Yachts, for €24.95 million ($32.84 million). 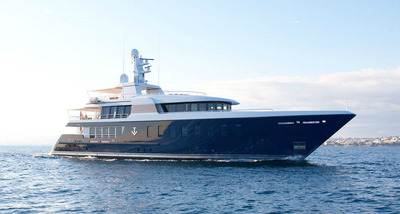 Looking for something a bit pricier?